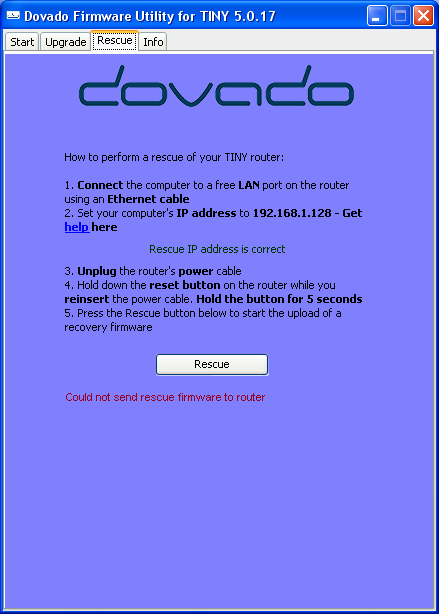 Customers with the Dovado TINY are advised to use the RESCUE utility to upgrade the router’s firmware beyond version 5.0.16. 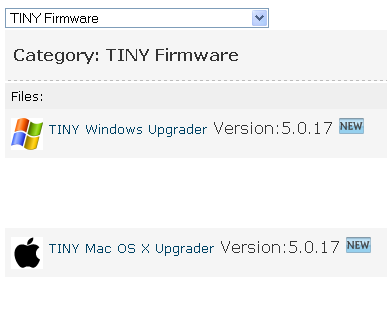 For this reason, you may notice that the usual ZIP version of the firmware is missing for 5.0.17 on Dovado’s firmware page (see above). These could be described as “cheapo” modems typically offered on pay-as-you-go deals. Dovado have explained that the power consumed by these modems can be particularly “spiky”, so an upgrade to the TINY’s bootloader was required to make the router more tolerant of this. Upgrading the bootloader is eqivalent to a BIOS upgrade on a PC, so the regular firmware upgrade is not enough. How do I set a static IP address on my ethernet? 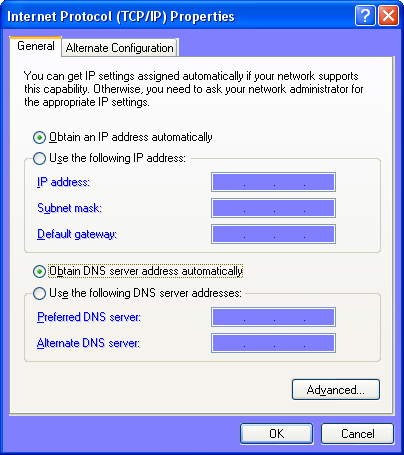 In Windows XP, right-click your Local Area Connection in your Network Connections and choose Properties. Scroll down through the list of items, select Internet Protocol (TCP/IP) and click Properties. Enable the “Use the following IP address” option and enter 192.168.1.128. A subnet mask of 255.255.255.0 will be entered automatically. Click OK to finish. In Windows 7, click Start and type Network Connections to search programs. Choose View Network Connections and right-click the Local Area Connection to select Properties. Among the items select Internet Protocol Version 4 (TCP/IPv4) and click Properties. Enable the “Use the following IP address” option and enter 192.168.1.128. A subnet mask of 255.255.255.0 will be entered automatically. Click OK to finish. 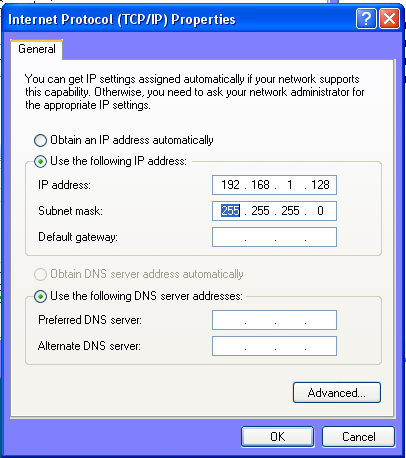 When restoring the properties of your ethernet connection, choose the Obtain an IP address automatically option and be sure to select the Obtain DNS server address automatically option below as well, otherwise your internet connection will not work. How can I be sure the TINY is in bootloader mode? 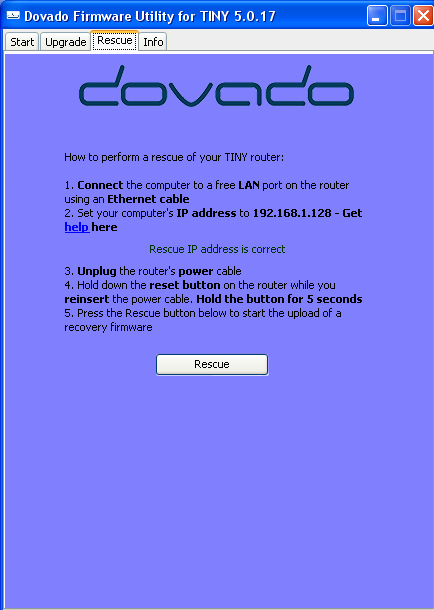 There are no obvious signs on the TINY or on the Rescue application that the esoteric press-and-hold manoeuvre on the reset button has successfully put the router into the special bootloader mode. However if it is not, the rescue will fail. i have a usb mobile broadband router from dovado. i understand that it is discontinued however when iupgraded the firmware it failed and now i am unable to connect to the router by any means. I have tried numerous methods to no success. when i plug the power cable into the router the power and wifi LED’s do come on and when i connect a network cable the port light comes on however i am still unable to connect to the device to configure it. i have tried holding the reset button down when the device is on and off and even while off and pluggng the power cable in but still nothing. I agree that getting a new router would be allot easier and less hassel however at this point I do not have that option. Your assistance with this would be greatly appreciated. Hi Brett – there are rescue utilities for the UMR (windows executable) and 3GN (zip file with windows executable and firmware image file. 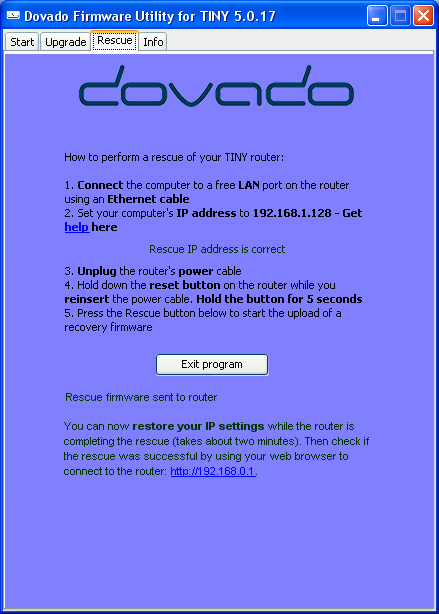 Both utilities require connecting to the router with an ethernet cable and setting a static IP address on the PC’s LAN Connection. 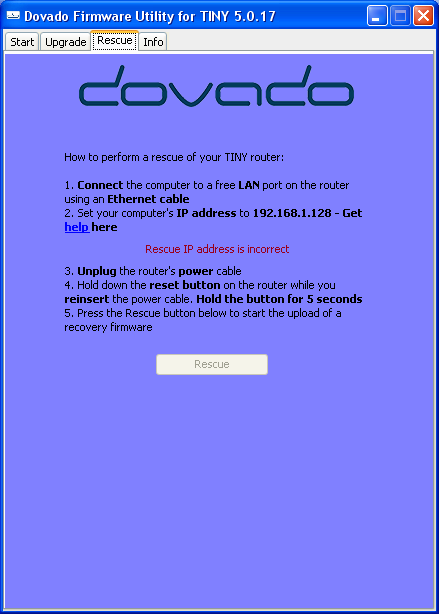 Specific details are displayed when you launch each rescue utility.